This class is for canvas enthusiasts who want to learn how to design and execute borders. The text will provide extensive information and photographs of various styles of border treatments, including simple as well as elaborate examples. 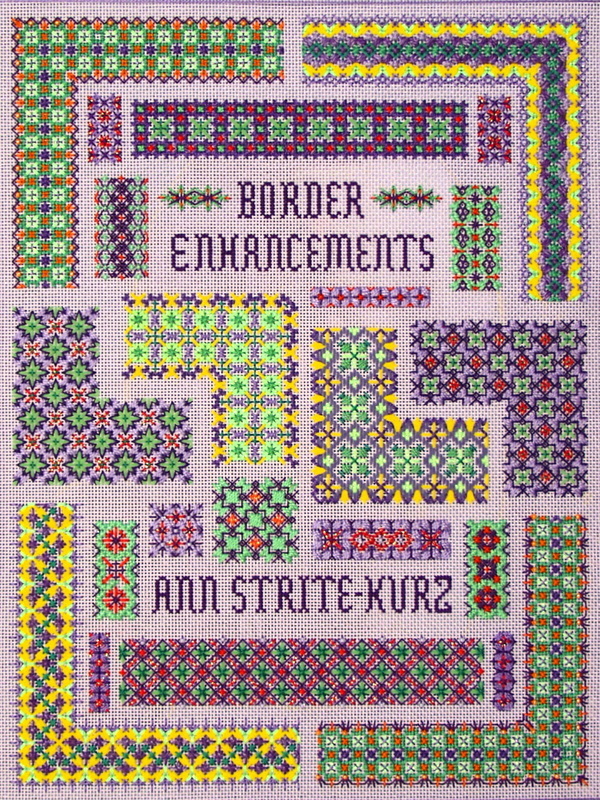 Ann will also share tips on planning appropriate arrangements, getting them to fit background patterns, planning sequences for composite borders, and adding corner motifs, spacers and edgings. Class time will be divided between pencil exercises and stitching plus lots of show and tell as students get creative! Color Choice: Yes. Students supply own canvas and threads with suggested guidelines. Good chance to use leftovers from other kits. Pre-work, if any: Optional. Students will receive the instructions for two composite borders in advance. Those who wish to participate will prepare samples for a discussion of color comparisons in class. Student Supplies: A 1" notebook, a 14" X 14" mounted canvas and a variety of threads from a suggested list plus the usual stitching accessories. Students may also bring projects to which they want to add a border and a favorite stitch encyclopedia to share.